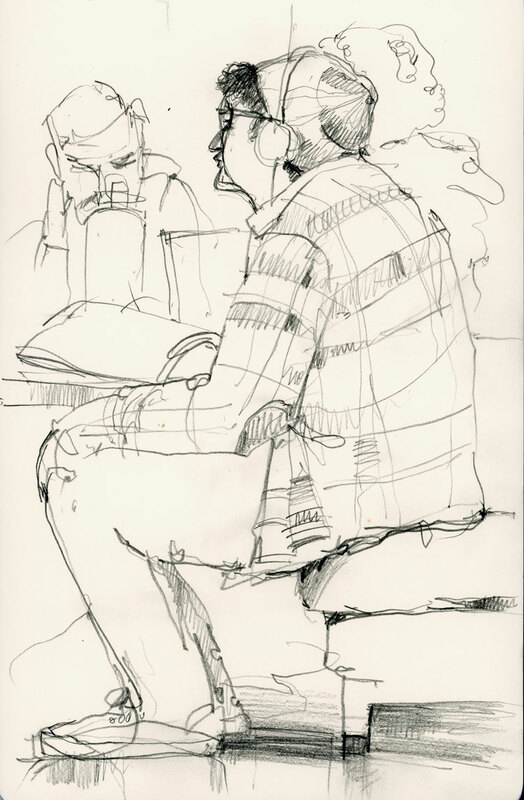 When I draw students in my school I usually sit in the cafeteria or student lounge. It is inevitable that they are sitting in groups (they rarely study alone) and almost always inevitable that one of them notices that I am drawing someone from amongst the group. 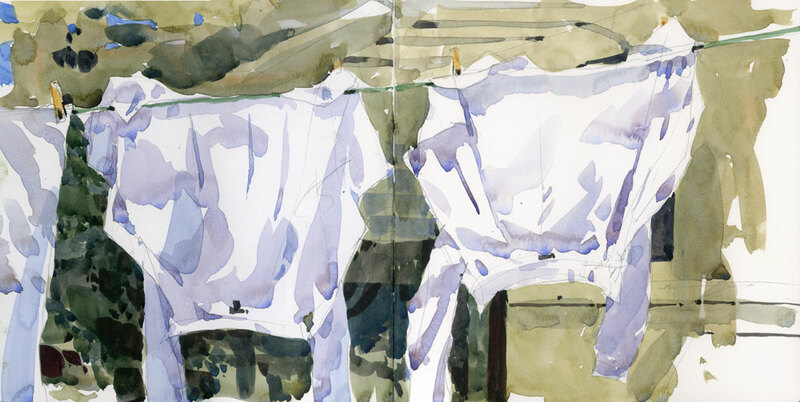 Much whispering and pointing follows, usually with the “model” — now self-conscious — turning around to see what I am doing, and if bold enough, coming over to see the drawing. On occasion I can get through a whole drawing without being noticed, like today, and then I feel that I have been given a gift — a few moments where I can draw undisturbed. It makes my day. This must be the best week to paint the changing colours of the trees in Montreal. All the trees still have their leaves, everything from sharp yellow to deep red to dark green. On a sunny day it’s a bit like trying to paint flames — a bit too glowing and bright. My method is to take everything down a notch. Soften it and let the colours flow one into another and hope that you capture the feeling of the season without going garish. 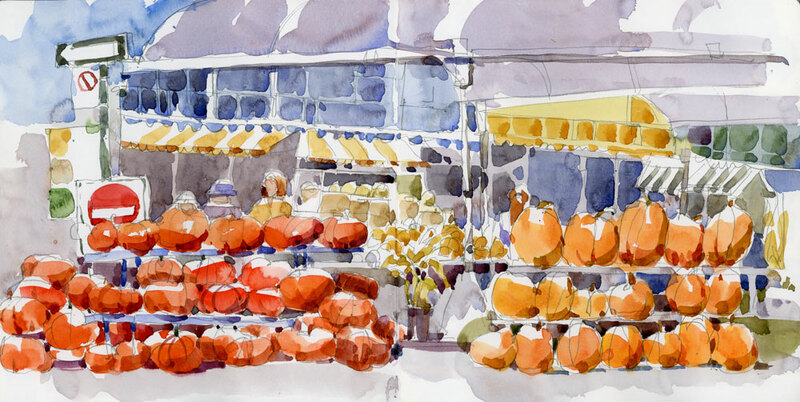 It was a perfect fall day in every way — warm and sunny, no wind, and a great turnout (lots of new faces too) to the Urban Sketchers Sunday outing at the Atwater Market. Lots of us sketched the pumpkins — it was hard not too since they screamed to be painted. I chose this competing display, the Rouge Vif d’Étampes on one side and the big old jack o’ lanterns on the other. 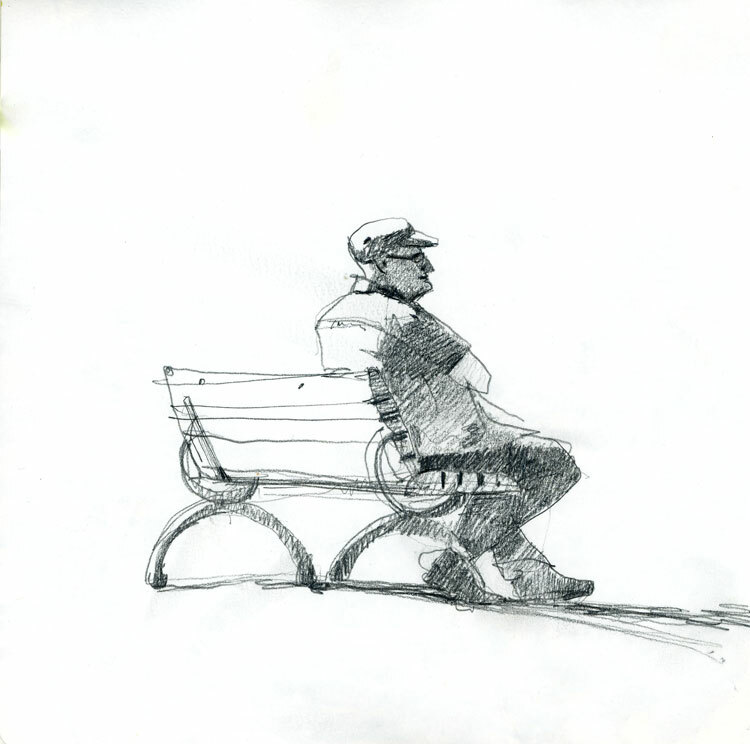 It’s no wonder this man sat in Kent Park in the midday sun. With near record warm temperatures for the end of September, it feels like midsummer. 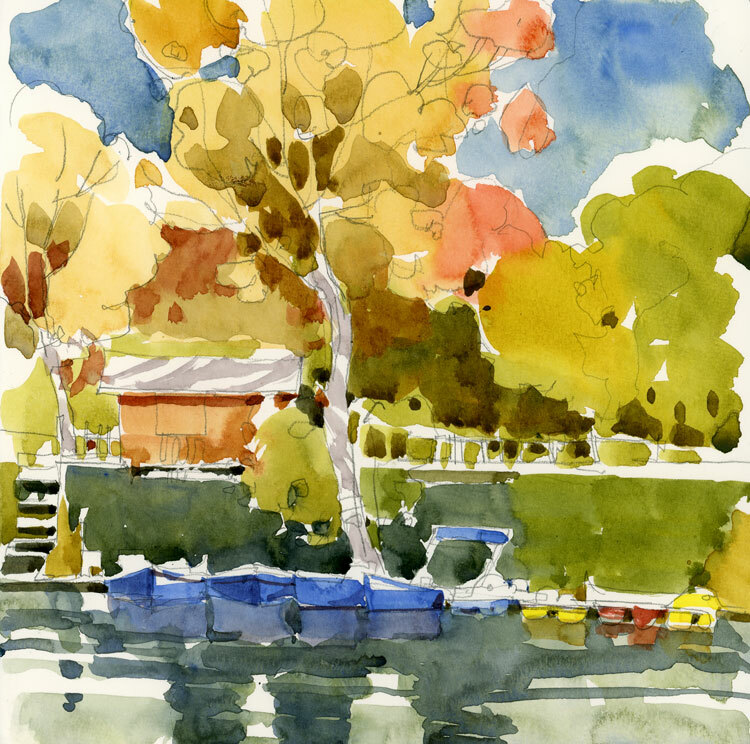 The heat should continue for at least two more days and that means we’ll have a great day for Sunday sketching with USk Montreal. We’ll be sketching around the Lachine Canal and the Atwater Market. Hope to see you there! I have spent a lot of time looking at water and trying to figure out how to paint it, and its mysteries have still not been fully revealed to me. 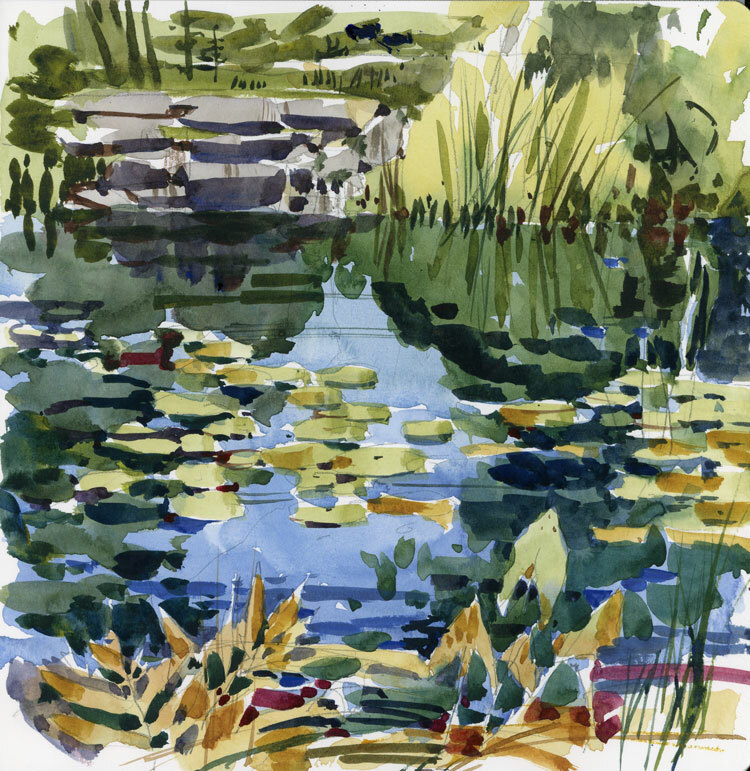 But I have sketched the pond in Baie d’Urfé often enough to at least have a plan of attack for how I lay down the washes. I start with the blue (leaving the lily pads white) that is a reflection of the sky and gets deeper and cooler as it comes towards me. There’s lots of cerulean blue up near the rocks and some cobalt added in as it gets darker. When that’s really dry, I add the tree reflections in different layers of dark green. The light colours in the lily pads are next, and then there’s a final layer of really deep and dark greens under the lilies. This usually has some darker blues like Phthalo or Ultramarine and even some Alizarin in it. The rocks, foliage across the pond and foliage closest to me are next. The final step is the calligraphy — the little grasses and brush strokes that are mostly done with a rigger. The garlic bundle is a study in contrasts — the heads pale, perfect, rounded, symmetrical and the stalks twisted and chaotic, dark and light. 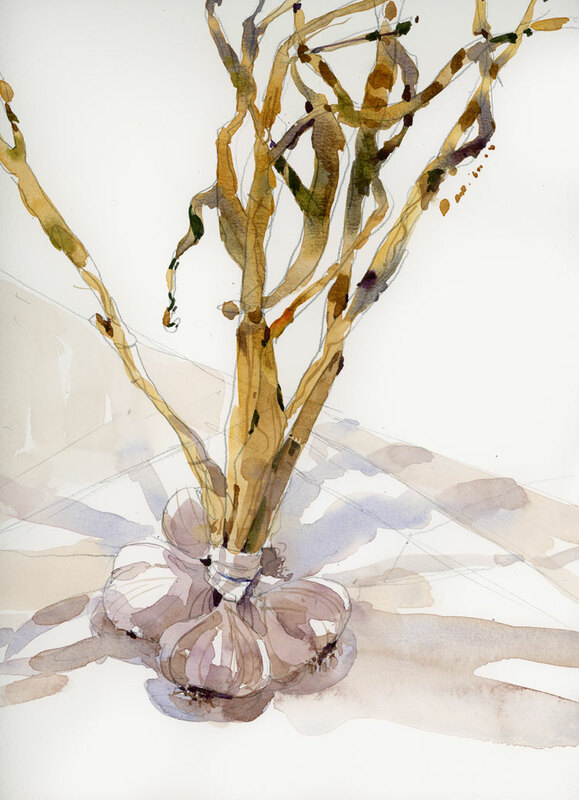 I didn’t realize until after my sketch was done that I painted them the same way — the stalks quickly and loosely throwing dark paint into light and the bulbs carefully and slowly with delicate washes and pale lines.